We live in very uncertain times. Humanity and all living things are constantly under threat and there is an urgent need to create the causes for harmony throughout the world. All of the world’s major religions and humanitarian traditions teach the ethical values of tolerance, patience, loving-kindness and compassion. As these universal values are embraced and take root in the minds and hearts of more and more people, world peace will become attainable. Maitreya Project is based on the belief that inner peace and outer peace share a cause and effect relationship and that loving-kindness leads to peace at every level of society — peace for individuals, families, communities and the world. 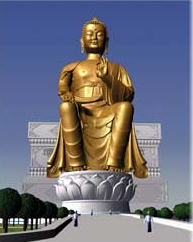 The Maitreya Buddha statue is being designed to last for at least 1,000 years. Through this entire new millennium and into the next, it will effect positive change within the hearts and minds of people all over the world and benefit the people of India through its social and economic activities. Maitreya Project’s vision includes schools that focus on ethical and spiritual development as well as academic achievement, and a healthcare network based around a teaching hospital of international standard to provide healthcare services, particularly for the poor and underprivileged. Maitreya Project is working with local, regional and state governments in Uttar Pradesh, India, where the Kushinagar Special Development Area Authority will support the planned development of the area surrounding the Project. The Maitreya Buddha statue is being built to bring as much benefit as possible, for as long as possible, so that loving-kindness will eventually arise in the hearts of all beings.